When I’m out of design ideas or have free time, I love to visit surf web showcase galleries to see some fresh web designs and get inspiration. But there are so many web galleries out there available and it is impossible to remember them all. Fortunately this website just solved the problem. 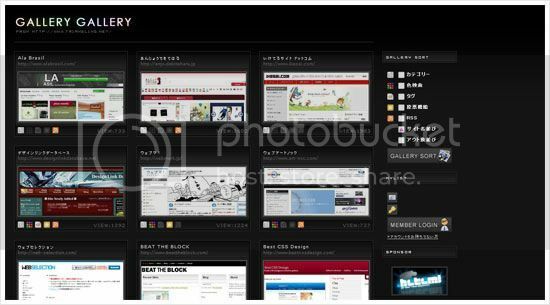 Introducing Gallery Gallery, a summary list of popular web galleries gathered in one place. Currently listing 179 galleries, well I think that’s a lot! Alternatively, there are some similar lists like Dia Chronie Web Design Gallery Links or The Great Web Design Gallery Round Up, but both of them are not as complete as Gallery Gallery. I think it is a very useful sites and should bookmark it for future reference. Actually there are some more others too but above are the most frequently visit one. And what’s your favorite web gallery? cssvault.com is one of my favs and so is csszengarden.com. Just like you I have tons of sites I like to go to but I always start here. I love your space so much~& i added you as my space link. I am so glad that you are a chinese too. Would you mind me introducing some information & link which you refer in my space? I think it is definitely useful, i think my friends sure be like it. dezinspiration is quite a nice site! Thanks for the intro. I visited Styleboost and CssVault too, but not that often. Best Saudi Arabian web design and SEO solution based company in Riyadh, Riyadh Web Design, Web Design Riyadh, Saudi Arabia Web Design, Website promotion company providing top 10 search engine ranking optimization.